We’d love your help. 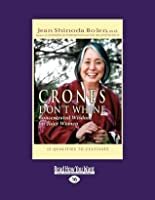 Let us know what’s wrong with this preview of Crones Don't Whine by Jean Shinoda Bolen. To ask other readers questions about Crones Don't Whine, please sign up. It was a time of great changes. Within a year, there was a mass deluge from the family nest, my first grandchild arrived, my husband had a heart attack, my career focus changed, and early indicators of menopause reminded me that the biggest changes were about to occur. I was leaving behind motherhood, making family meals, and picking up abandoned dirty dishes. I was moving on to a new phase of my life. For me, the word crone has always brought up images of a wise elder. A crone as I see her is a It was a time of great changes. Within a year, there was a mass deluge from the family nest, my first grandchild arrived, my husband had a heart attack, my career focus changed, and early indicators of menopause reminded me that the biggest changes were about to occur. I was leaving behind motherhood, making family meals, and picking up abandoned dirty dishes. I was moving on to a new phase of my life. For me, the word crone has always brought up images of a wise elder. A crone as I see her is a woman of confidence with a heart large enough to take on more than just her immediate family. She is the kind of person who’ll be completely honest with you when you need it most or make you laugh yourself silly when you’re down. In the last year, as my life changed, I actually felt privileged that the universe saw enough wisdom in me to allow me the privilege of becoming such a woman. I first read this book just as I was just admitting that I was leaving behind middle age and approaching menopause. So technically I was not yet a crone. I so am now. Hecatate of the Crossroads show me the Way. The technicalities remain the same: Veer off the Spiritual Path too far, you land in the field of one character defect. She encourages the juicy-crone reader to stay on the Path by highlighting the Path. Bolen is one of the most beautiful soul-expanded women I (kinda sorta) have met. She wr I first read this book just as I was just admitting that I was leaving behind middle age and approaching menopause. So technically I was not yet a crone. I so am now. Hecatate of the Crossroads show me the Way. My Self-Assessment: I progress. I become one with the Waning Moon. I wish for a 2.5 star ... I didn't dislike it but I didn't really like it either ... but I'll err on the side of generosity and give it three stars. Published before the era of blog posts and internet articles, this book is lacking depth. It really reads as an inflated blog post. The tenets are fine ... good reminders of where i am on my crone journey ... but there's really not much substance to the book. This was a Mother's Day gift from my daughter Victoria. I LOVE it. 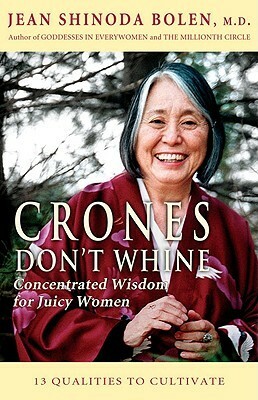 Ms. Bolen lists thirteen qualities a crone should strive for, including non-whining and juiciness. I'm trying to acquire the qualities. I was disappointed. There just isn't any depth in this book. I had hoped for guidance and suggestions and perhaps personal stories to use for my personal growth. I am glad I only paid ninety-nine cents for it. Very disappointing, I don't think that she said much of anything. Short, pithy and affirming. each phase of life has its worth and value. embrace it. For women of a certain age this is a manual of self-help and redemption. It recommends finding ways to be happy and then doing so. All with a zen-like wisdom and understanding. Bolen writes a gentle book that invites mature women to embrace power, joy and compassion in the second half of life. She has a New Age feel, but it's not off putting for those who don't get their inspiration from archetypes of goddesses. Each chapter is short, averaging 5 pages in a small book with large font. They are perfect for setting an intention before meditating or attending a yoga class. Or a chapter can serve as a writing prompt for writing in a journal. A lot of her observations are c Bolen writes a gentle book that invites mature women to embrace power, joy and compassion in the second half of life. She has a New Age feel, but it's not off putting for those who don't get their inspiration from archetypes of goddesses. A lot of her observations are common sense, but it's very easy to play the victim, get stuck in a rut, and isolate oneself from others. Her words can serve as a reminder to what we already know intuitively but forget all too easily. "To be a crone is about inner development, not outer appearance. A crone is a woman who has wisdom, compassion, humor, courage, and vitality. She has a sense of truly being herself, can express what she knows and feels, and take action when need be" (p. 4). "If you find yourself at ... a crossroad, may you know which path has heart and have the courage to take it" (p. 52). "Flexibility, resourcefulness, good health, friends, the ability to learn and keep on growing, being needed or doing service, having absorbing interests, and the ability to enjoy your own company are qualities and possibilities that make improvising a good life possible" (p. 71). "However, crones don't bore others with a litany of their symptoms-organ recitals or tales of woe-that have an air of performance or bragging. A crone knows she and her troubles are not the center of the universe and knows other people have problems, too. A crone doesn't indulge whining children or whining inner children. Especially her own." And so begins this tell it as it is book written by the inimitable Jean Shinoda Bolen. Crisp, surgically precise and exuberant with reconceptualizing and em "However, crones don't bore others with a litany of their symptoms-organ recitals or tales of woe-that have an air of performance or bragging. A crone knows she and her troubles are not the center of the universe and knows other people have problems, too. A crone doesn't indulge whining children or whining inner children. Especially her own." This delightful little volume distill a good deal of Shinoda Bolen's hard-won wisdom. As I reach cronehood myself, it's reassuring to see, through the author's eyes, the gifts and possibilities of this time of life. There's wisdom here, and I will pay it forward by passing this book along to another crone. Minor detail: I do, however, consider it a stretch to put Jimmy Carter in the same category as Nelson Mandela, Mahatma Gandhi, and the Dalai Lama. Wanted to love this. Some good kernels of wisdom but for some reason the advice rang trite to my ears. Still, couldn't resist reading this book since I have a crone in my backyard holding up the brick garden edge. And, we need to honor our inner crones and remember they aren't evil but wise women. Excellent! A type of philosophy to aspire to. If you're 60 and beyond you must read this! A smart little book. Implementing. This book was short, but I greatly enjoyed the wisdom packed in the pages. I'm not chronologically a crone, but this is wisdom for all ages. While I don't think this is necessarily a well-written book, the content is superb! All of us in our third phase of life can benefit from her insight and affirmation. Loved it! If you are looking for a book that is related to Moon magic and Pagan origins, this isn't what this book is about. This is about the coming of age in women...how we recreate ourselves and transform into the wise woman crone. It describes the feelings and the lessons that we learn and can pass on to others. It talks about what a Crone is, what it means to be a Crone. It's about feeling good in your own skin. Being who you are and not being afraid to be yourself totally and also speak your mind. It If you are looking for a book that is related to Moon magic and Pagan origins, this isn't what this book is about. It made me wonder when I gave up being the wild wise woman and a smother myself in suffering. It is normal to grieve, but it is not healthy for a woman to give away her power, her self-ness, her wildness. It made me find my strength again and I am sure that I will have this as a go-to book for the down moments that will come...but I can tell you, Dr. Bolen, I am a survivor, a warrior woman and a Crone and I thank you for giving me the tender slap in the face I needed to get back on my feet and start living again! Mature women working together can improve the world and themselves. Bolen examines the history of religion, gender differences, conflicting values and patriarchal agendas that have brought us to the brink of destruction and endless wars. It is up to mature women to reclaim their power and create a world that works for all of us. Seems to be a timely message...we need equal representation of women and men in positions of influence and power to bring balance, equity and peace to the planet. Crone Mature women working together can improve the world and themselves. Bolen examines the history of religion, gender differences, conflicting values and patriarchal agendas that have brought us to the brink of destruction and endless wars. There are 3 phases of a woman's life: waxing, full and waning or otherwise known as maiden, mother and crone. A crone is not a bad thing. It refers to a woman who is in or past menopause and is at a stage in her life where others' peoples opinions dont matter so much anymore. She has grown into herself, knows who she is and what has madew her strong are all the struggles she had on the way to getting to this point. The book is short, just a little over 100 pgs. and is full of wit and humor and There are 3 phases of a woman's life: waxing, full and waning or otherwise known as maiden, mother and crone. A crone is not a bad thing. It refers to a woman who is in or past menopause and is at a stage in her life where others' peoples opinions dont matter so much anymore. She has grown into herself, knows who she is and what has madew her strong are all the struggles she had on the way to getting to this point. The book is short, just a little over 100 pgs. and is full of wit and humor and wisdom. Some of the phylosophy was not what I believe but, that's ok, I can look past that and chew on the real meat the author is serving here. Read this a second time on the train March 9th. Pencil in hand the second time around. Still arather "meh" response however. There are bits well worth having read and a couple of spottieds well into other reading I've been doing of late but I'm not in the right place for this one at the moment perhaps or others held more for me. It's small and pithy so give it a shot if it sound at lall right for you. This book was way too short! I argue that if we have made it to this age in one piece, whining has not been a big part of our lives. I know it hasn't been part of mine. Bitching, yes, whining, no . And there is a whale of a difference. I have a sign in my bathroom that reminds me everyday that we don't whine. Another in the kitchen reminding guests to breathe more and whine less. They work, most of the time. Every other page at least there was a gem. A nugget of truth I knew but didn't know I knew and needed to be reminded. I'm going to find a statue of Hectate, ancient mythical Greek goddess of crossroads. She has three faces - to look at the path you arrived on and the two ahead of you to chose from. Ah! cronehood, who knew! This book was gifted to me, so I read it. Mostly stuff I already knew, mostly stuff I agree with for a mature woman like myself. Younger women may or may not relate to much of this information, because I believe one must experience this life to truly understand and appreciate the many lessons we learn as we live fully. I loved this book! I am approaching 48 and I'm already perimenopausal...I feel like Im on the threshhold of "croneness." I already feel and see the 13 qualities either just beginning to bloom or set firmly in place. I found this book to be life affirming and validating and despite some other reviews, i think the author accomplished this without male bashing. Jean Shinoda Bolen, M. D. is a psychiatrist, Jungian analyst, clinical professor of psychiatry at the University of California San Francisco, a Distinguished Life Fellow of the American Psychiatric Association and recipient of the Institute for Health and Healing’s "Pioneers in Art, Science, and the Soul of Healing Award". She is a former board member of the Ms. Foundation for Women.